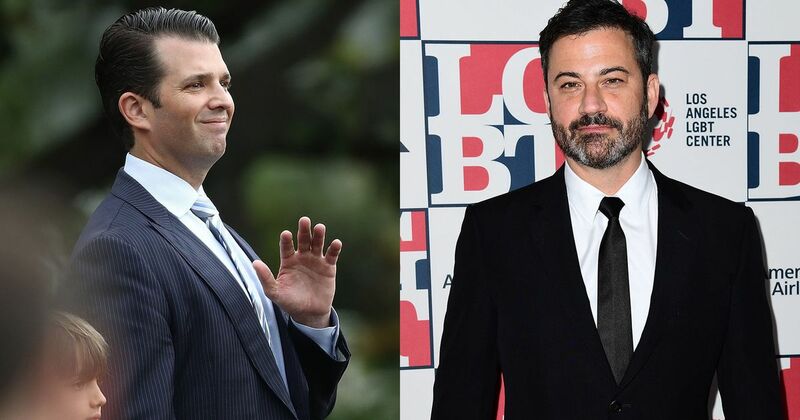 Donald Trump and Donald Trump Jr. had nothing better to do than come for Jimmy Kimmel this weekend, 140 characters at a time. It backfired spectacularly. Kimmel called for Trump to quit on Sunday morning after the president tweeted his displeasure with late night hosts who he believes are “dealing with the Democrats” due to their anti-Trump material. Trump Jr. took it upon himself to chime in on Twitter too. Trump Jr.’s response to Kimmel was a pivot to Harvey Weinstein, the producer who was fired from The Weinstein Company after sexual harassment claims arose last week in a New York Times exposé. “Great,” Kimmel responded. “In the meantime, enjoy this!,” he wrote, attaching the infamous Access Hollywood video of the president and Billy Bush, in which Trump speaks lewdly about women. Trump Jr. has yet to respond to that particular tweet, but he should probably keep his eyes and ears open for whatever Kimmel has in store for this week’s monologues. Judging by his recent ones, he will most definitely have something important to say.